Have you ever wanted to share science-based information about a sensitive topic, but didn’t have the talking points or the comfort level to do so? Consider attending our Sensitive Issues Training! 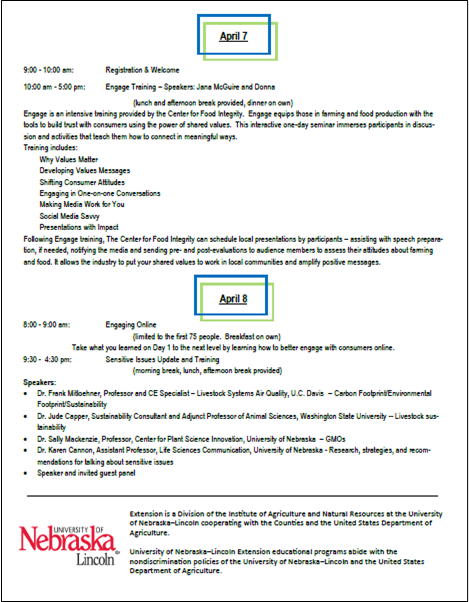 On the first day, the Center for Food Integrity will provide their “engage” session which helps you with talking points and working with media. The second day learn from experts on various sensitive issues such as GMOs and Food Safety. Registration fee for the two days covering materials, meals and breaks is $100. This will be an Excellent opportunity and we hope to see many attend! (please click on the pictures below to enlarge). 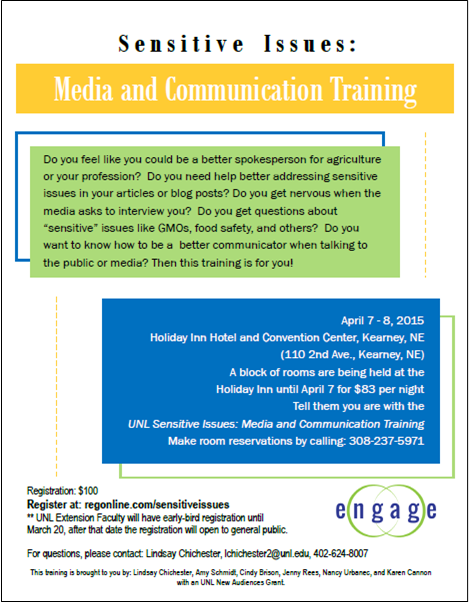 Posted on March 25, 2015, in Event and tagged food safety, gmo, media training, sensitive issues. Bookmark the permalink. 1 Comment.